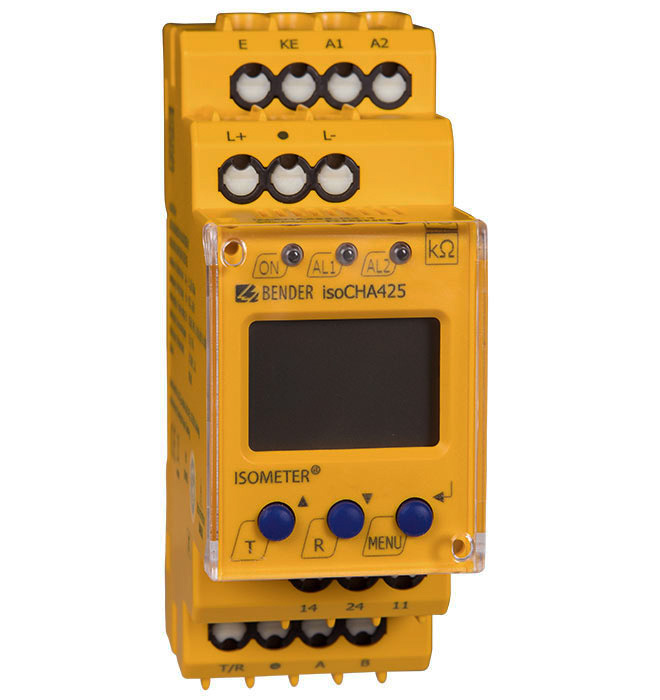 Bender has specially developed the new isoCHA425 insulation monitoring device for monitoring the entire charging circuit in DC charging stations. Monitoring is performed according to the Japanese CHAdeMO charging standard. The CHAdeMO (Charge de Move) electrical interface for electric cars was developed in Japan and is now in cross-brand usage and can be found at every third charging station worldwide. To guarantee electrical safety in the charging circuit, the DC charging station is set up as an unearthed DC power supply (IT system) complying to IEC 61851-23. During charging, an insulation monitoring device (IMD) in the charging station monitors the entire charging circuit right up to the electric vehicle. The vehicle's IMD must be deactivated during this process. Bender now offers, in addition to the CCS-compliant isoEV425, the new IMD isoCHA425 complying to the Japanese CHAdeMO charging standard for DC charging stations. The isoCHA425 is designed for a nominal voltage range between DC 50 V and 500 V. Single-pole insulation faults Rf are detected and reported within 1 second, two-pole insulation faults Rf (insulation fault Rf simultaneously between DC+/earth and DC-/earth) within 10 seconds. The maximum permissible system leakage capacitance Ce is 2 µF. The device measures insulation resistance RF and system leakage capacitance Ce to earth. It also measures the system voltage Un between L+ and L- and the residual voltages UL+e (between UL+ and earth), and UL-e (between UL- and earth). The isoCHA425 detects the faulty system conductor DC+/DC-, i.e. the distribution of the insulation resistance between the DC+ and DC- system conductors, from the minimum value of the nominal system voltage, and indicates this with a plus or minus sign for the insulation resistance measurement. Partial resistances can be calculated from the total insulation resistance RF and the faulty conductor (R %). It is also possible to assign a detected fault or faulty conductor to an alarm relay via a menu. If the values RF or Un continuously exceed the response values activated in the "AL" menu for the period ton, a message is output via the LEDs and relays K1 and K2 according to the alarm assignment set in the "out" menu. The operating principle of the relay (n.o./n.c.) and the fault memory can also be set there. Device functionality can be checked using the test button "T". Parameters are assigned to the device via the LC display and the control buttons on the front panel; this function can be password protected.